Are you tired of headaches interfering with your life? Headaches are not just part of life. Let us help you make them a thing of the past! Constant dull ache in the back of the head, eyes or temples. At Aushealth Physiotherapy we see multiple patients every day with this type of headache and we pride ourselves on getting the very best outcomes for each individual. Cervicogenic headaches can affect your ability to concentrate, make you feel unrested after sleep and leave you feeling just not yourself and we know how disabling this can be. The Physiotherapists at Aushealth understand that correct diagnosis is crucial to the effective treatment of cervicogenic headaches and so we conduct a thorough assessment to determine the exact cause of your pain. We take into account all the factors that can contribute to your headaches including work place ergonomics, posture, sport and leisure activities, neck stability and core strength, ensuring you get the best possible result. From this we generate an individual treatment plan to help you become and stay headache free. To stop headaches being part of your life, call Aushealth Physiotherapy "Your Northern Beaches Physio" for an appointment with one of our expert Physiotherapists today. To Download our Awesome Headache Guide please click HERE. 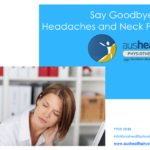 Aushealth Physiotherapy proudly services Brookvale, Freshwater and the Northern Beaches for headaches.